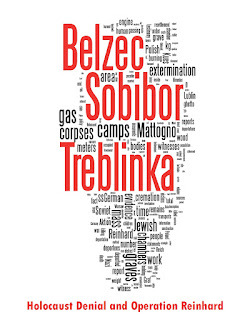 The penultimate installment of One Third of the Holocaust begins with a treatment of what the Ugly Voice calls "the third most important book" on Treblinka: Alexander Donat's The Death Camp Treblinka. Donat, we're also told, wrote The Holocaust Kingdom as well. In the front of the book, a description of Holocaust Kingdom is given: "The journeys of the author and his wife through four countries and nine death camps." "Maybe they weren't death camps," the UV smugly suggests. Well, there weren't nine death camps, and the six camps that were death camps were only in one country, so here the UV is partially correct. 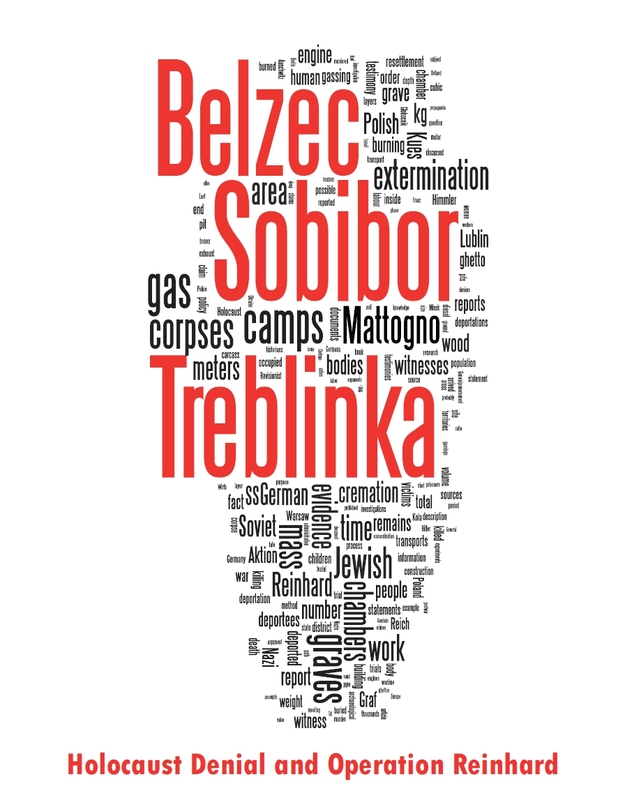 However, three of these camps were Treblinka, Majdanek, and Auschwitz -- all extermination camps. For Donat, as for many survivors, however, even the camps that weren't designed as extermination camps were "death camps," e.g., Dachau, where there were regular atrocities committed but mass extermination didn't take place. "Death camp" ends up being rather an inaccurate term. "Extermination camp" is more precise, but even then it can fall short, as Auschwitz and Majdanek also had large labor division, and even Treblinka seems to have occasionally served as a transit camp for small numbers of Jews fit for labor, sent from there to Majdanek concentration camp. If someone survives something, it naturally follows that nobody could have died in the event in question. Nobody died on the Titanic, the Hindenburg, at Stalingrad, 9-11, etc. Yankel Wiernik's A Year in Treblinka appears in Donat's Treblinka book, as the UV points out. Note that much earlier in the film UV had said that Wiernik's book was hard to come by. In fact, he claimed such in Part 1 of the film, something Roberto has already disproved. The UV's claim is that Donat, in including Wiernik's account, changed Wiernik's words on the size of the Treblinka gas chambers. However, the contemporaneous Yiddish translation does agree with what Donat's version says, as Sergey pointed out some time ago. In the House account, Rajzman gave Sept. 17 as his date of deportation to Treblinka. In the account included in Donat's book, however, Rajzman says he was deported on Yom Kippur 1942, which fell on Sept. 21. I think that the UV makes a very big deal over a four-day difference, particular since the later account, which had given Rajzman the chance to actually check his dates, gives a date that is listed on Arad's list of deportations from Warsaw to Treblinka. The UV thinks Rajzman changed the date to Yom Kippur to look more pious. However, even agnostic Jews observe Yom Kippur; next to Passover, it is the most widely obvious Jewish holiday. The UV quotes a Jewish Web site on the issue that "No work can be performed on that day," i.e., Yom Kippur, seemingly implying that Rajzman wouldn't (or shouldn't) have been working on that day. He doesn't take into account that the Nazis never respected the Jewish religion. If they did, so-called work Jews would have been given every Saturday off from work. They weren't. Quite notable here is that the UV suddenly mentions the Dusseldorf trials Roberto wrote about at length. He also mentions the trial of Fedor Federenko, which is fairly unwise considering the sworn statements he made to American government agents in Hartford, Connecticut in May 1976. They are mentioned in this article by Christopher Browning, author of the excellent studies Ordinary Men and Origins of the Final Solution. That the date of Rajzman's deportation was Yom Kippur leads the UV to a comparison to Ben Hecht's story in Reader's Digest, featured in Episode 9 and already shown to be true by yours truly. We should take a moment to note that it is true that Rajzman's different testimonies present certain problems, not the least of which are problems with consistency in the details. Is it possible that he "embellished" his account over time? Yes, it is. But is there any question that this man was in Treblinka? Absolutely not. Next we cut to footage of Treblinka barber Abraham Bomba. Deportations began from Czestochowa on Yom Kippur, Bomba says, and on the day before Sukkoth (September 24) was the second transport, of which he was part. I guess this is included to indicate that Bomba is also lying, but, again, Arad's deportations list clearly shows that deportations from Czestochowa began on Yom Kippur. The UV cuts to the bios of 60 Treblinka survivors given in Donat's book at the camp. He notes Donat's surprise at not being answered by many survivors. I don't find this surprising consider that very few people talk about their unpleasant past experiences and, in fact, the suicide rate among Holocaust survivors was signficantly higher than that of the general population. E.g., see this medical abstract. What does the UV expect? That these people should want to relive Hell over and over? The UV tells us from looking at the list of survivors that these were "Yiddish speaking people of the Jewish religion who lived in Poland during the war." However, look closely as the UV pages through the book. Among the names given are Oskar Berger and Richard Glazar. Look very carefully here, because it quite clearly is shown in the film that both of these men were from Czechoslovakia. Czech Jews tended to be German speakers or Czech speakers (the most famous example, Franz Kafka, was a German speaker, as were my own Czech-Jewish ancestors) -- they were not Yiddish speakers, as Yiddish was rarely a spoken language among Jews in Austria-Hungary or, later, in Czechoslovakia. In fact, look at this list of Treblinka internees. The three members of the Breslauer family listed were from Germany, as was Siegfried Bernstein, Gustav Jordan and Henny and Herta Rosenbaum, Gella Streim, and Clara and Theodor Tuch. Hans Burg seems to have been Czech, as were Hans Freund, Pawel Frey, Samuel Lichtblau, Rudolf Masarek, Milos Schmolka, Karl Unger, and Hanus Volga. Adele and Alexander Blau, Margarethe Hiiferding, Friederike Meier, Emil Pottner, and Petr Strenberg were Austrian. That's twenty-four prisoners that we know of that weren't Polish Jews and didn't come from countries where Yiddish was spoken. Now the UV deals with this question: If you claim millions didn't die, then where did those Jews go? They emigrated, he answers. He attempts to use the list of sixty Treblinka survivors as a "random sample" of Polish Jews, but he can't do this. Why not? Because this is not a random sample; this is a very specific demographic, as any statistician could tell you, first of all because they all shared a common non-demographic experience and, as already shown, they weren't all Polish! "There are millions of European Jews in Israel, not thousands," The UV states. This is because the Holocaust didn't happen. Well, for one thing, the CIA Factbook tells us that about 22.6 percent of the Jewish population of Israel is from Europe or America. That would be about 1.1 million European or American Jews living in Israel, assuming the population's composition by ethnicity and origin didn't change between 2004 and 2006. Of course, native-born Israelis are the majority, but population statistics show that only slightly more than half of the Jews in Israel are Ashkenazic (i.e., Eastern European) Jews. The rest are from North Africa, the Middle East, and Asia. One of the examples of name-changing that the UV gives is Rudolf Reder (formerly Roman Robak). The problem is that "Rudolf Reder" isn't a Hebrew name; it's a German name, perhaps a variation on Reeder, i.e., a shipowner. The last person the UV mentions is Arad himself, born Yitzhak Rudnitski. We're told he spoke Yididsh, but how do we know that he spoke Yiddish? As established by myself elsewhere, not all Polish Jews could speak Yiddish. Then we're told about Arad's military career in Israel. What does his military career have to do with any of this? Is it merely another ploy by the UV to not-so-subtly bring Zionism into the discussion again? And the 5,000-year-old population of Egypt that Arad fought? It's only been an Arab population for about 1,300 years. Before that, they were Greek-speakers. Five thousand years ago, the Egyptian population was entirely different from the one that is there now. But the UV barely knows Holocaust history, so I guess we can't expect him to know North African history.